Denne private tur giver dig mulighed for at vælge at se den kinesiske mur fra landsbyen Huanghuacheng eller at vælge et besøg i Himmelske Freds og Forbidden City. 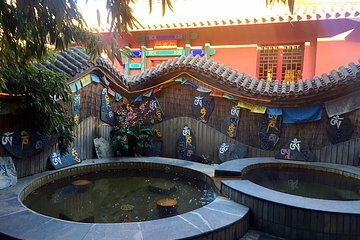 Med en af mulighederne kan du stoppe for en traditionel kinesisk frokost på en lokal restaurant og nyd en spa-behandling på Hot Springs på Jiuhua Resort, herunder massage i hele kroppen. Plus, denne tur gør planlægningen lettere på dig med rundturstransport inkluderet. Din tur starter med en tidlig morgen afhentning fra dit hotel i Beijing. Til indgangen til Great Wall, efter afhentning, slappe af på turen over til den del af væggen, der er i landsbyen Huanghuacheng. På væggen, tag i bjergudsigt, og vælg at tage en bådtur på Haoming Lake (egen regning). Walk Spirit Way, og se Ming Tombs, og stop for en kinesisk frokost på en nærliggende restaurant. Derefter bliver du sendt til Jiuhua Resort til din Hot Springs spa behandling. For den forbudte by indstilling, efter afhentning, vil du blive overtaget til Himmelske Fredsplads og Den Forbudte By. Din guide viser dig rundt, og lader dig også udforske. Derefter vil du blive shuttled over til Jiuhua Resort, hvor du kan spise frokost før din Hot Springs spa behandling. Uanset hvilken turopsætning du har valgt, slutter din dag med drop-off på dit hotel i Beijing. Tibetan Hot Springs are closed for refurbishment but was taken to Chun Hui Yuan I had an amazing time would love to return to this facility it was very amazing and I was well pampered. Firstly the Great Wall at Huanghuacheng, wow what an amazing natures beauty spot. This scenic area combines the beautiful lake wrapped around the base of the mountains with the great wall on its skyline. We had time to walk up the steps of the wall to the soldiers stations and enjoy the view of the area higher up. The wall is steep to climb, I am not particularly fit but managed to climb up at my own pace with our guide Maria. It was worth it for the view. Maria was a fantastic guide who ensured we had plenty of photos, water and was great company. We had a walk around the chestnut orchard planted by the soldiers. This whole area is mainly visited by the locals which added to the ambience rather than other sections that were more tourist driven. After our Great Wall experience it was time to stop off for lunch. We went to an old traditional hotel and Maria asked us if we would like to order ourselves, we requested Maria to choose for us, and she checked that it was food we liked before ordering and we were very pleased with her delicious choices and there was more than enough food for us all plus a takeaway box for our driver from what was left. Please note this is a full day tour! Then the visit to the Ming Tombs, in honesty this wasn't our thing and we would of happily missed it. However, it was interesting and the tombs are an important and unique part of Chinese culture and gave time for our lunch to settle before the part of the tour we were really looking forward to, the hot spring spa and massage. On arrival at the spa we were served tea and snacks before being taken to our private area. The hot spring lives up to hot. There were three pools you have the option of testing each a little hotter than the previous one. Our aching muscles from our hike melted away with all our worries and stress, after the hot spring we showered before getting into a Chinese Medicine bath. Please note we used swim costumes for the private hot spring and then we were naked in our personal bath and for the massage covered with towels. There was an option to be in our own room each or we could share a room - it was our choice. After the special bath we proceeded to receive the massage, my oh my, wow! The whole time there was a unique special Chinese routine and massage which was different from home and yes I would go back tomorrow for a repeat. That night we both slept very well and when we flew home the following day we had no aches and pains from all our adventures. Be open minded and relax through this almost 2-3 hour spa experience that is truly special and a pure pleasure.